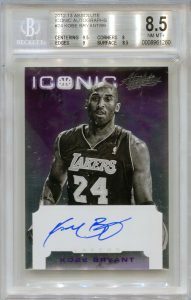 Kobe Bryant BGS Certified Autographs Now In Stock At GradedSports.com! Kobe Bryant are now in stock at GradedSports.com! Also in stock are great graded PSA/DNA and SGC autographs from Elvin Hayes, Bailey Howell (HOF), Magic Johnson, Doug McDermott, Ray Meyer, Robert Parish, John Paxson, Scottie Pippen and Dennis Rodman. 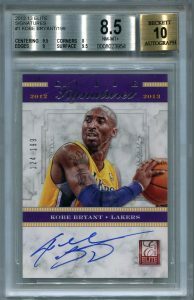 Or see our complete lineup of graded sports cards and autographs by visiting the GradedSports shop on Amazon. 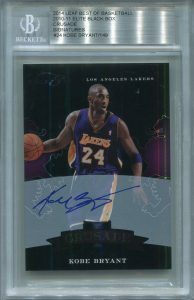 And don’t forget Graded Sports is always buying basketball hall of fame certified autographs in PSA/DNA or BGS holders. Visit our Sell Your Cards link for more information on how to sell your basketball card collection today! 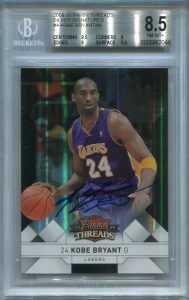 This entry was posted in Graded Basketball Cards, Graded Sports Autographs, New Releases and tagged basketball autographs, graded basketball cards, kobe autos, kobe bryant autographs, psa/dna basketball. Bookmark the permalink.